One constant danger while you're fishing is the possibility of damaging or breaking your pole. So what happens to an angerlish if its pole is broken? Does it regenerate? Does anyone know? I'm curious because the wolf-trap anglerfish below looks to have such a complicated set of tackle protruding from its head. 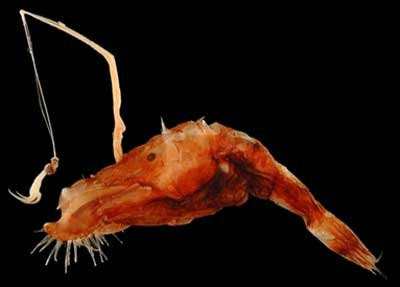 We know why it's called an anglerfish. But why wolf-trap? It has to do with the shape and mechanics of the fish's jaw. The upper jaw is three times larger than the lower jaw, and it is able to open and close sideways. When in the ventral position, the upper jaw combines with the lower jaw and forms a compartment in which prey is held just prior to being swallowed. Think of a Venus flytrap. Or, think of it as a wolf trap. Thanks for the anglerfish, Theodosia and Chris. that- is a BEAUTIFUL ugly animal- evolution is teh awesome!